I’ve recently setup a Desired State Configuration (DSC) configuration on a computer that had the Hyper-V role installed. The DSC configuration was supposed to apply once and reboot the computer once done. I was using a script resource but I failed to make it bulletproof. 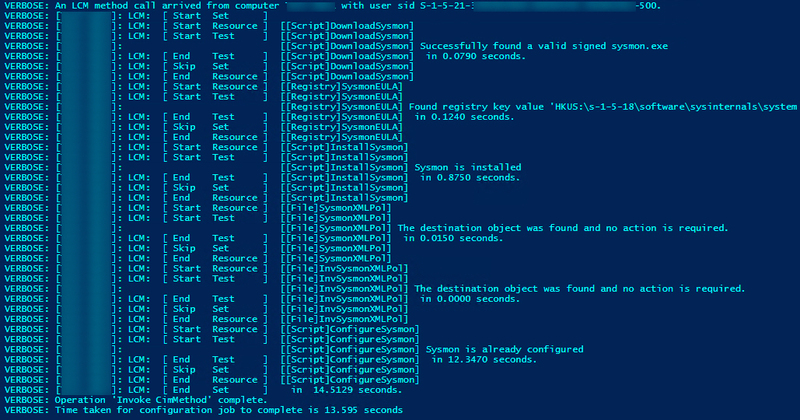 The test part of the script resource always failed and returned false when the Hyper-V role was present. It created a reboot loop. I had to find a quick way to stop the DSC config to apply and remove it. I’ve been using Desired State Configuration (DSC) recently on a Windows 10 computer to create a custom remote endpoint configuration. Using the Register-PSSessionConfiguration with a -Force switch parameter breaks the push. The WS-Management service cannot process the operation. 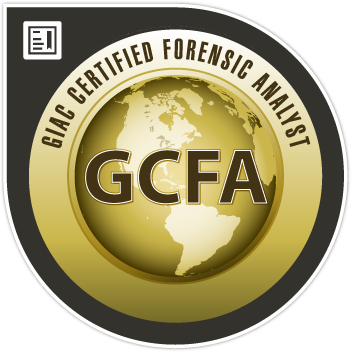 The operation is being attempted on a client session that is unusable. This may be related to a recent restart of the WS-Management service. Please create a new client session and retry the operation if re-executing the operation does not have undesired behavior. If you specify a -Verbose switch parameter when you push the configuration with Start-DscConfiguration cmdlet, the verbose stream of the Register-PSSessionConfiguration cmdlet is still streamed although it’s explicitly turned off. turning off the verbose stream from the Register-PSSessionConfiguration cmdlet by enclosing this cmdlet in scriptblock executed by the Start-Job cmdlet. I’ve been using Desired State Configuration (DSC) recently to create a cmd file on every users’ desktop. I’ve used a File resource to create the content and a dependent child script resource that removes the BOM. 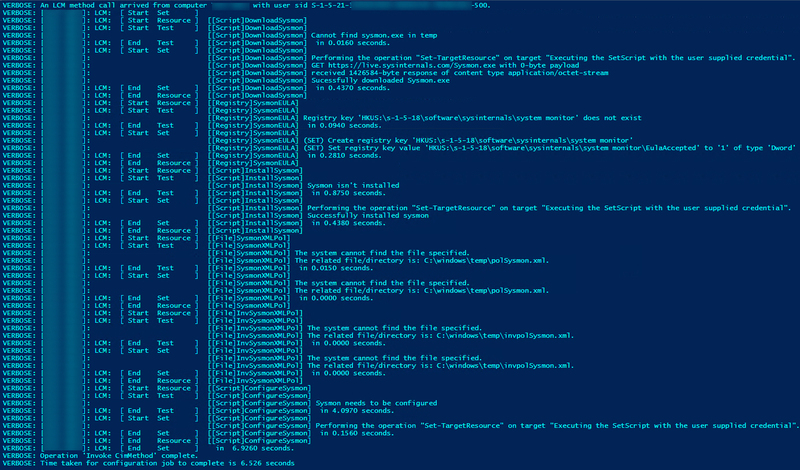 If you want to do more advanced stuff, my fellow Windows PowerSell MVP Carlos Perez wrote an awesome module named Posh-Sysmon that would help you create XML configuration for Sysmon. In March 2015, I’ve asked the following question to Thomas Garnier who co-authored this awesome sysmon tool with Mark Russinovich. 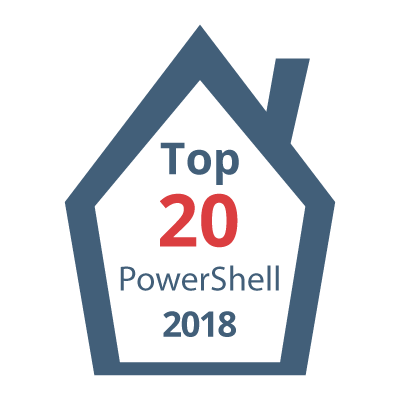 Now with DSC (Desired State Configuration) and PowerShell, it can be fairly easy to deploy and configure it compared to my previous post about Applocker. I’ve created two scripts, one to install EMET and one to remove it (because of continuous delivery of every product, right?) that can be run as of Windows 8.1 and Windows 2012 R2. 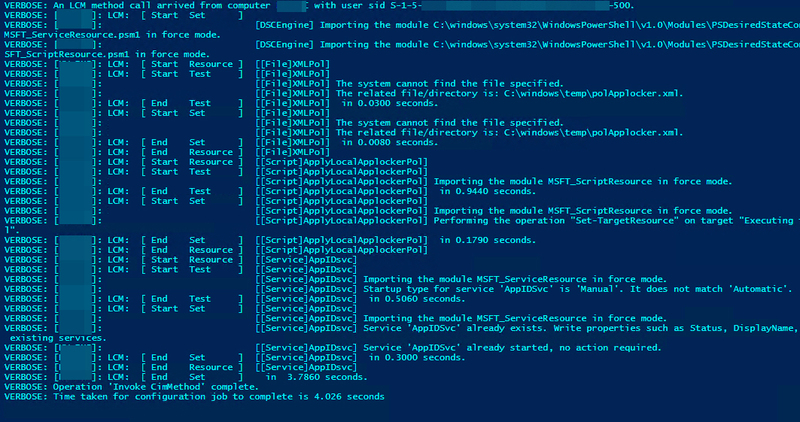 Yes, DSC is built-in PowerShell version 4.0 that was released along with Windows 8.1 in August 2013. The configuration of EMET 5.2 is based on XML files although EMET 5.2 can also get its configuration by GPO in a domain environment. The XML configuration that you’ll find below is an export made with the EMET_Conf.exe after an import from the “Recommended Software.xml” profile provided under “C:\Program Files (x86)\EMET 5.2\Deployment\Protection Profiles\”. Although I probably could, I chose to not handle Certificate Pinning rules because a new GUID for each rule is generated by the XML export made with EMET_conf.exe. If I did, it would have complicated the comparison made by the Test-TargetResource and probably slow it down. I know that the built-in package DSC resource can download the file from the web if I specify a URL as a package source but I preferred to rely on my own custom script to download the file as it performs some additional steps such as checking the integrity of the file (is it the hash we expect) and whether the file is digitally signed (and recognized as such for the time being). The initial download takes around 9 seconds. I was working with Desired State Configuration and wondered why a custom DSC resources hasn’t been published yet for Applocker. Bitlocker has already its experimental DSC resource. Why Applocker doesn’t have one? I also wondered what it really takes to configure Applocker with PowerShell Desired State Configuration. Do not apply this on your servers/workstations if you don’t understand what Applocker does. The deny rules are just examples. I don’t have anything against these software editors. Yes, I know that’s not the most secure Applocker configuration as the example below mixes both a very permissive (default) whitelist and a very specific blacklist. Applocker rules can be imported from/exported to a XML file using the GUI or using the cmdlets of the built-in Applocker module (it exists since PowerShell version 2.0 on Windows 7). 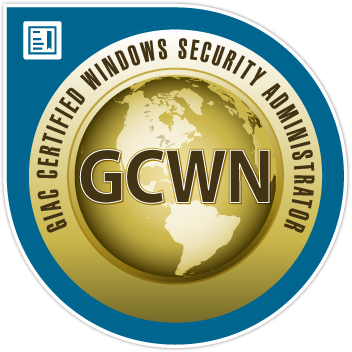 XML seems to better way to go although the Applocker policy can be found in the registry under the HKLM\SOFTWARE\Policies\Microsoft\Windows\SrpV2 key. The applocker policy depends on the ‘Application Identity’ service to be enforced. Based on the above light requirements, it seems that built-in DSC resources would actually make it and allow to deploy an Applocker policy locally. To configure Applocker, I need first to export the Applocker policy to XML and dump its indented representation to a file. To solve the indentation issue, I’ve used the Format-XML function written by Jeffrey Snover that you can find on this page. The second step consists in creating the file locally with the XML content thanks to the built-in File DSC resource. To decide whether to apply the policy, I’ll export the current effective Applocker policy and compare it to the XML file. Once the Applocker policy is applied, I’ll start the required service. 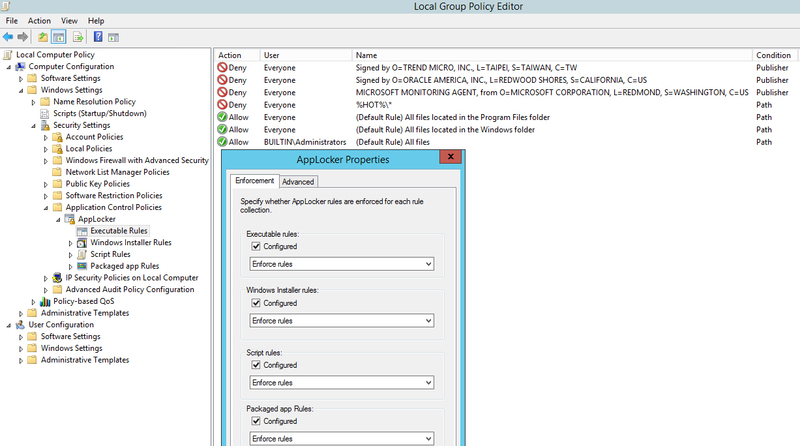 Here is what the DSC configuration looks like to deploy locally an Applocker policy. If I apply it one more time, we can see that all the tests performed are skipped as my system is already in the desired state. Here’s how to achieve the exact opposite, i.e., clear the local Applocker policy and stop the required service. Again, applied one more time, we can see that all the tests performed are skipped as my system is already in the desired state.